There comes a point, whilst you're browsing one webstore, catalogue, shop shelf or another, when your latest hobby plan reaches critical mass and overpowers common sense regarding the number of unfinished projects cluttering up your hobby space. It transforms from 'exciting idea' to 'burning, un-ignorable desire'. At that point all you can do is hope that when you wake up next morning the damage to your bank balance/significant other's hobby tolerance/sanity isn't irreparable. It's the nature of the 21st century that within 36 hours of me biting the bullet and clicking 'checkout' this fine collection of sprues and dreams was on my doorstep. But why Tau, you ask? A fair question, and one I would've regarded as moot just a few months ago. The Tau had never previously interested me; indeed I found them a little distasteful, morally, in that they appeared to have some, and that just didn't fit my world view of 40k, no, no, not at all. Whilst I would never begrudge anyone's else's right to see and play the universe as they saw fit, I knew inside that the Tau were an aberration, a corporate shill, only for Johnny-come-lately's and Anime kids. In short, they weren't proper, and they sure as hell weren't 40k. They also coincided almost exactly with my leaving the hobby, and their arrival seemed to only confirm to me that giving 40k a rest was a good idea. Summer/Autumn 2001; a time that will be remembered for dark events, but also the release of epic mini-series Band of Brothers, and a strange, ill-fitting race of blue aliens; the Tau Empire had arrived, so I left. My first actual contact with the Tau was via Dawn of War and its expansions, namely Dark Crusade, which introduced both Necrons and the Tau, and made them both stupidly, brokenly OP. 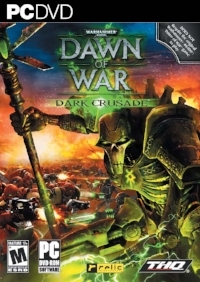 DoW, Winter Assault, DoWII, Chaos Rising...could I find my copy of Dark Crusade's Tau cover?...of course not. Fast forward a few years, and I had been pulled back into the hobby with 30k, and thus had avoided the advent of the much-abhorred 'Fish o' Fury', a tactic nearly as game-breaking as its virtual predecessor. The Tau were shooty, gloriously so, but also a little bit snarky, too good for their own (greater) good. They had suits galore, markerlights and actual Railguns for blowing vast holes in any who stood before them. And then came the Riptide. No, I'm not dirtying this post with an actual picture of a Riptide. For shame! The Riptide could do everything. Shoot, take a hit, thrust move, throw a pie plate, you name it, it did it, and it was undercosted to boot. And people hated it. Take three, and your opponent was liable to just pack up and leave before you rolled for the first turn. The Tau had now firmly established themselves as 'That Army' for 'That Guy'. The only crime more heinous was to ally with Eldar...Another notch on my anti-Tau post, right? And yet...the new, white Vior'la scheme came to my attention. Huh, Tau didn't have to be ochre...interesting. With the advent of 8th Edition, I was looking forward to picking up a couple of the new indexes - one for the Guard, one for my Orks (let's not talk about them for now). But oh no, sneaky GW had to bundle a few other armies into the Ork index didn't they? And so I found myself endessly reading and re-reading the Tau section. It was all new to me, plasma rifles, ion blasters, good old, cherished Devilfish with Burst cannon...oh yes, this could be me, this could definitely be me...and what's more, they weren't broken, OP, or even that good at shooting. They could even be a little Grimdark thanks to their Ethereal pheromone shenanigans. And the Riptide costed a fair amount of points! Praise the Emp- Tau'va! I could play Tau, and I wouldn't neccessarily be shunned for it. Onwards then, For the Greater Good.